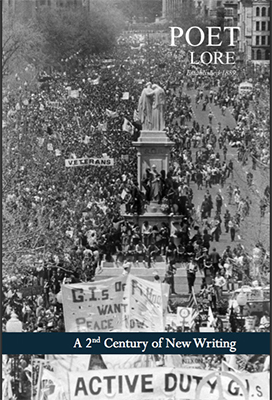 The protesters pictured on our cover massed in Washington nearly half a century ago, but the view is eerily contemporary. The issue then was U.S. involvement in Vietnam, a policy decision that had been sold to Americans for years—first with obfuscations and later with lies. Hundreds of thousands of citizens gathered in resistance, active-duty G.I.s and veterans among them, uniting to “speak truth to power.” They marched and chanted and raised home-made signs, public acts on a scale that couldn’t be ignored. But equally effective were acts of imagination that took place out of view: the work of poets, playwrights, singer-songwriters, and screenwriters who gave our fractured culture a new way to see what was happening. In 1988, we attended a poetry reading by exiled Russian “dissident” Irina Ratushinskaya at the Folger Library, two blocks from the Capitol. In that intimate space, she let the audience pass around plastic sleeves holding scores of tiny papers: the poems she’d written during her four-year imprisonment for—writing poetry. She had composed each one with a burnt matchstick on a bar of soap, committed it to memory, and then washed it away—later rendering it on a strip of paper to be smuggled out in the shoes of sympathizers. Maybe it’s the very intimacy of poetry that so frightens dictators. An essay in this issue (Sarah Pemberton Strong’s “Pet Rock Tricks: Metaphor and the Physics of Imagination”) argues that metaphor has the power to broaden the scope of our thinking: “When a poem causes us to re-examine what we thought we knew, it expands more than our knowledge of what is possible: it expands the possibilities of what is knowable.” The poems in these pages (including translations of work by Togo’s Anas Atakora) expand possibilities on a wide range of subjects, beginning with the dangers of love—which, like the dangers of power, can be fatal. We open with Natasha Trethewey’s sonnet “Shooting Wild,” a warning against silence in the face of abuse, and move to “Perch” by Jennifer Jackson Berry, which offers another kind of warning—“They die from swallowing the hook”—leaving each of us to consider all that it suggests. What To Do with Hopes Washed Up at Our Feet?